Waking up this morning from barely sleeping, a little here, a little there; the overrated nature of sleep is well known but not well appreciated. I read in Theater Undergrounds blog (look for link to left) that my pleading to be included on their page of local sensitive artist types has worked so well that I’ve been invited to place some of my words there. Obviously a bit pink in the cheeks and thankful at this I will comply with said request. and gladly. british war advert advising the best thing to do while the bombs are falling around your head. While this has nothing to do with the above or below I’ve been dying to post it as the advice is sound. No sense in losing your head while others are literally losing theirs all around you. on a bench drawn with broken pen. the rain of last night. have a weekend. – J. Your poetry is frigging brilliant.. 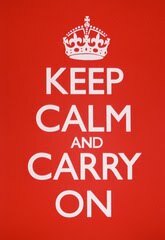 I stole the “keep calm” picture you've got posted up there. Great find! Ah! Thank you Pat, very gracious indeed, humbled in fact. Glad you liked the image Adrian. sitting with nothing is a very respectable way to sit, i think.